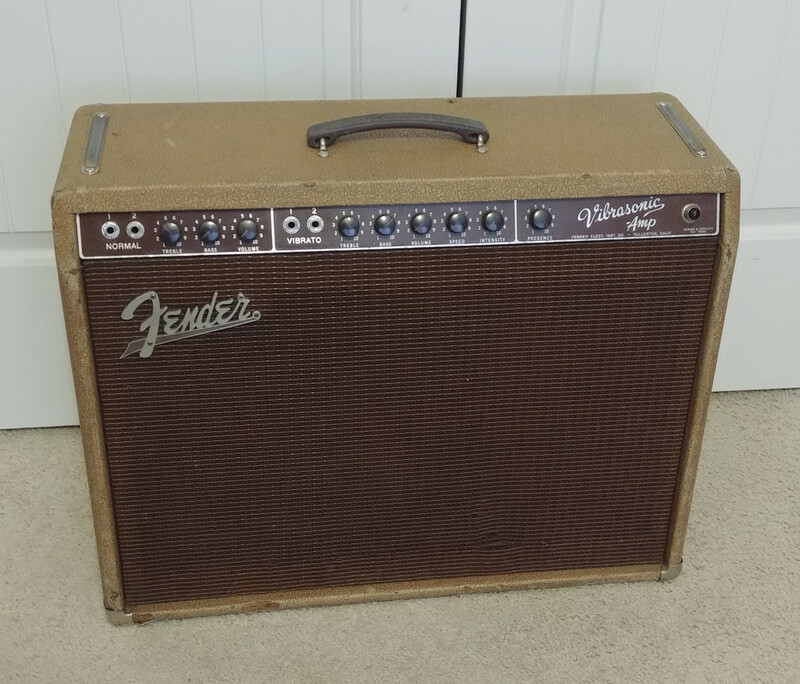 Rare 1960 Fender Vibrasonic amp, this is the first tolex covered front facing controls combo amp model made by Fender. 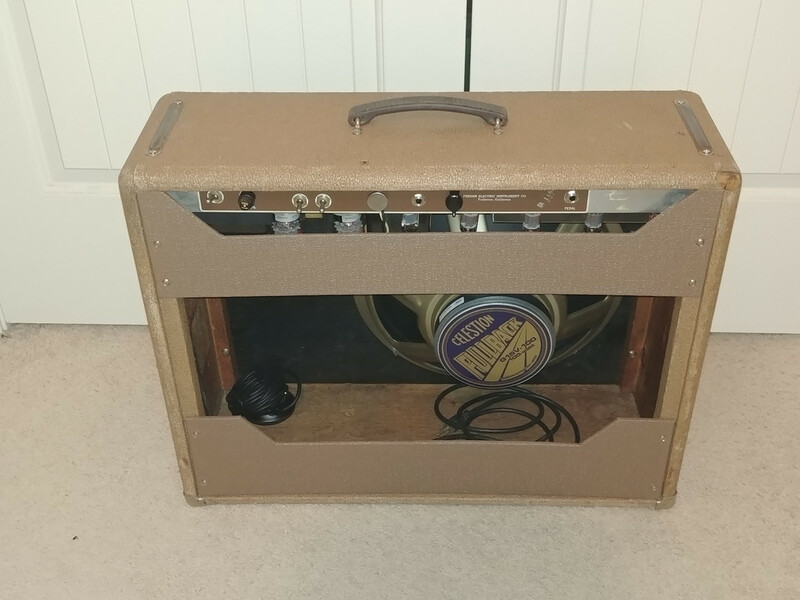 A few were made in 1959 and production ended in 1963 when the blackface Vibroverb replaced it. 1-15" speaker, 50 watts, has that great brownface Fender harmonic tremolo. This is even more rare as the volume control is in the center on both channels. I bought this amp as a non working basket case. Original chassis w front and rear plates but it had non original power and output transformers, someone had robbed all the old caps from inside and it had wiring issues to say the least. The amp was missing the original JBL 15" speaker. A 1/4" jack was added for the tremolo switch and an additional hole drilled in the back of the chassis for a tremolo on/off switch. The cabinet has original tolex, baffle has the original grill cloth. There were non original tilt back legs installed which I removed. 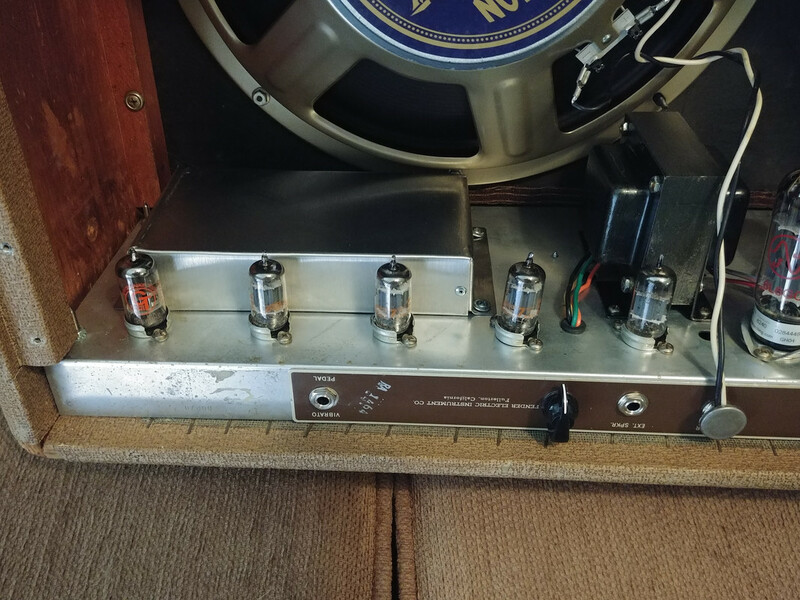 I had a local amp tech rebuild the amp, he stripped it down and completely rebuilt it , all new cloth covered wire, new good quality caps. He reused the original resistors if they were still good, original circuit boards, all the potentiometers were good. Original knobs and handle. Installed new input jacks and output jacks. Amp was previously converted to a 3 prong ac cable. The original filter cap cover was missing and it is a non standard size, I had one made that works. Since there was already an extra hole the tech installed an impedance selector knob , in the middle it is 8ohm, to the left 4ohm to the right 16 ohm. 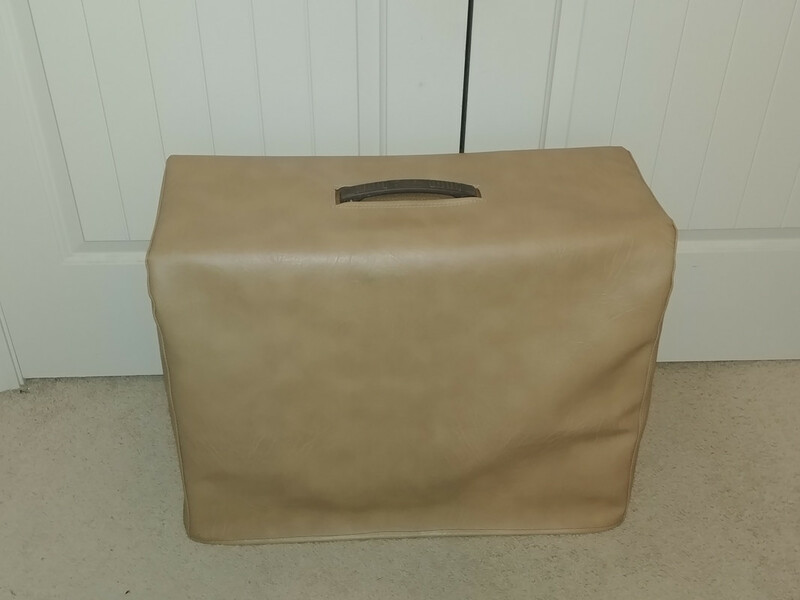 The back panels were missing so I made and installed new ones with modern brown tolex which is not an exact match, the very early brown tolex is a different color, and unavailable. Comes with a new Fender single button footswitch for the tremolo, and a tan vinyl amp cover. The speaker is a new Celestion Fullback, 8 ohm 100 watt speaker, it sounds great. This is a players amp, if you want a vintage amp that is dependable that you can go out and use and gig or record with this is it. This amp sounds great with single coils or humbuckers and no doubt steel guitar also as that was the original intent I believe for this amp. I have used a Digitech reverb pedal into the amp and it sounded amazing! Local Memphis TN area pickup or I will ship it within the continental USA only. I am not sure what shipping will cost and it will vary depending on location. I will pack the amp very well and fully insure it. 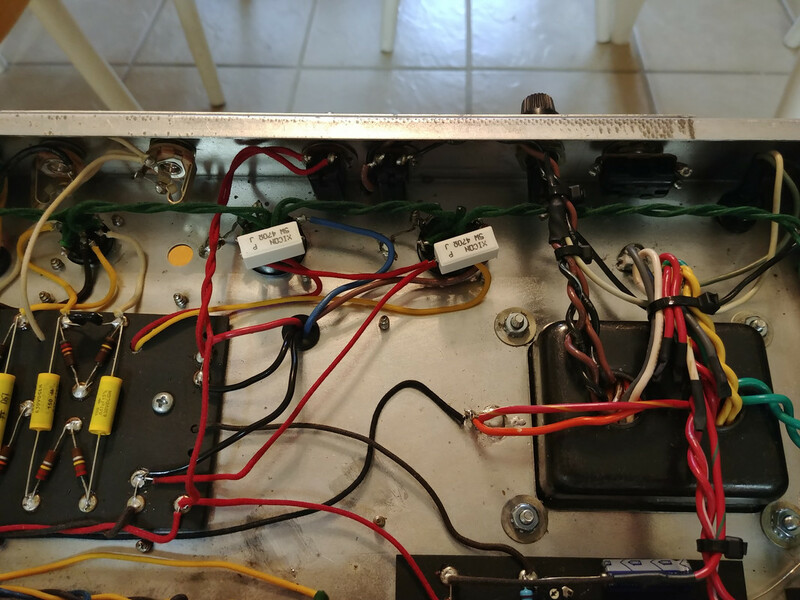 I have pictures of the amp before the rebuild if needed and I can provide the amp builder info and receipt for the work that I had done. $1800 + actual shipping, or as mentioned free local pickup. WOW, I like Mike. I am glad you left as original as you could. I bet it sounds sweet. 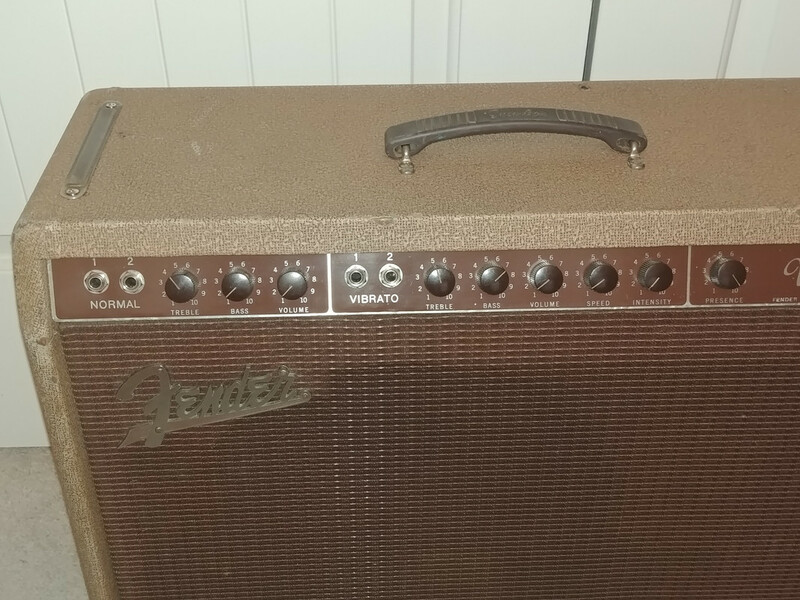 I am not a buyer but someone will get a very sweet sounding amp. Perfect small room amp. Black Rains SD-10, Peavey LTD 400 with 15" Telonics, Sho-Bud Seat, Goodrich Pedal, Sho-Bud Bar, Picks, Cords. it is really a great sounding amp, and if it doesn't sell I won't be heartbroken. It's really not too heavy either, about like the SF Deluxe Reverb amps I've owned in the past, nothing like a Twin Reverb weight. No dog in this hunt, but I bought a '66 Deluxe Reverb from Mike probably 6 or 7 years ago. Outstanding communication before, during and after the deal, and a great guy to do business with. 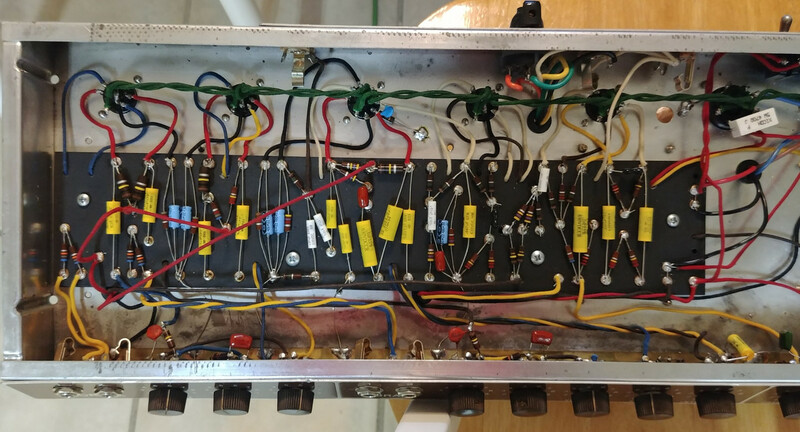 If you're worried about spending a chunk of money on a vintage amp, Mike is a guy you can trust. How ya been Mike? Long time!! Posted 13 Feb 2019 8:06 am Thanks Bill! 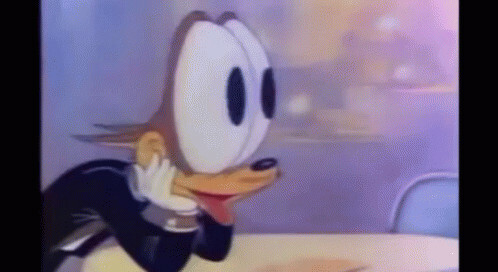 That was a nice Deluxe Reverb, do you still have it? It is a good one, and I do indeed still have it... As far as amps are concerned, they tend to come and go around my house, but that one is on the 'keeper' list.